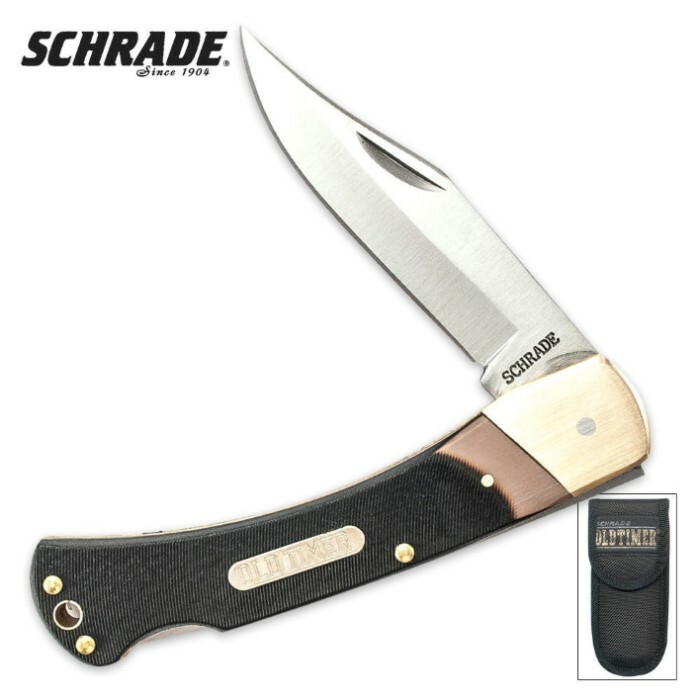 Schrade Old Timer Golden Bear Pocket Knife | BUDK.com - Knives & Swords At The Lowest Prices! At 4.9" closed, with a razor-sharp 3.9" high carbon stainless steel blade, Schrade's Old Timer Golden Bear makes for the perfect everyday folding pocket knife. The saw cut handle, nickel silver bolsters and handsome brass pins complete this classic Old Timer design. Store and carry it in the Old Timer nylon sheath. While I've never been fond of folders (a knife that's broken in the middle), Schrade's 60Tango aka Golden Bear meets the local constabulary's sub 4 inch limit for carry, making it a superb EDC tool. The blade comes shaving sharp from the factory, is easy to touch up with a sharpening steel and opens & closes with ease. The carry sheath is brilliant in execution with a belt clip rather than a loop, making it easy to attach & remove w/o having to undo the belt. The saw-cut Delrin handle scales are durable and adequately thick for my small hands. The thong hole should work for 550 paracord if you need a lanyard or wrist loop. If I had to nitpick, it doesn't have a thumb stud to support rapid opening, but the nail nick is deep & wide if time is of no consequence. Absolutely one of the best choices for the money and something to hand down because it's durability is a Schrade hallmark.